The tourist wastelands mark in a decisive, recurrent and permanent way the landscape of the tourist islands of the French Polynesia. Our study makes their exhaustive inventory and a classification according to their degree of desertion and considering how long the fallow land has been in existence. Will be broached the variables of the explicative system of the size of the “stock” which augments and lasts according to unknown economic factors. We will show that this complex system reflects permanent and socioeconomic more cyclical identity blockages, that can be found, with a lesser extent, in a lot of emblematic tourist destinations, that mark the tensions arising between the local host of a global tourism. 1Tourism wastelands are permanent components of the French Polynesian touristic islands landscape. This paper will document them on the most frequented islands, specifically, Tahiti, Moorea, Bora Bora, Tahaa and Huahine, and the analysis will be extended also to the associated archipelagos. Firstly, tourism wastelands will be classified by their degree of desertion and the length of time they have been in existence. Secondly, the mechanisms that lead to the creation of a tourism wasteland « stock », which in the French Polynesian tourist islands continues to expand, will be explained. 2Even though in a humid environment, tropical vegetation re-growth occurs quite quickly, any attentive observer would notice that tourism wastelands block public access to important parts of the islands. This results in inaccessibility to the seaside and social impacts which transcend the tourism sector. Both public opinion and scientists agree that this is linked to land possession issues, as in Melanesia for example, where it is linked to customary laws. This paper, without minimizing the land possession aspect, will go further into the analysis and will examine the impact of wastelands on tourists, on investors that sometimes covet them, and on the locals who live next to them or are squatting within them. 3A tourism wasteland is a space seized in fine by tourist activity, totally or partially abandoned for a short or long period of time, without any demolition of the built infrastructures and without any reconversion to new economic activity (Soja, 1996 & Chaline, 1999). It ranges from partial desertion (Tiki village (Document No5b)) to seasonal or multi-annual desertion and even permanent desertion. The indicator used in analyzing the difficult economic and structural adaptation of the tourist facilities is the size and duration of the wastelands’ desertion. The biggest wastelands will therefore be considered as indicators of low reactivity or even as a failure to adapt. However, they are also a sign of local re-appropriation of the land, both literally and figuratively. In a way, a third space (Vannier, 2003 & Clément, 2004). 4It is on the island of Tahiti that the first tourist wastelands have been observed. It is also on the island of Tahiti that these tourism wastelands last the longest. Bel Air Hotel in Punaauia is today’s oldest tourism wasteland in French Polynesia, together with the abandoned site of Matavai Hotel (Holiday Inn) in the neighbourhood of Tipaerui, located to the east of Papeete. 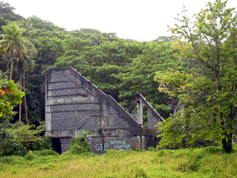 Due to its state of ruin, the Matavai Hotel, built by the beach between the Maeva Beach Sofitel and Beachcomber Hotels (two of the three biggest hotels on the island) is considered to be an eyesore. The tennis court became a parking lot for local 4×4 owners who consider themselves the legitimate owners of the property (Documents No.2b & 13). In downtown Papeete, located on the Vaiete square, the only Ibis Hotel on the island, Prince Hinoï (1984-2007) (Document No.2b), is another tourism wasteland. As for the mythical Royal Papeete, built in 1930 and closed in 20091, facing the ferry-boat quay, authorities plan to build in its place, a parking lot. Ten kilometers more to the East, there is the Tahaara Hotel (Hyatt Regency Tahiti), a beautiful construction located on a rocky spur overlooking the sea and surrounded by 8 hectares of landscaped garden (Document No.2d). Closed in 1998, it is now deteriorating (with a leaking ceiling) while the Beach club has also been closed since 2009. Lacking maintenance, the latter is squatted on by the attendant’s close friends, who, following a local tradition and in company of their families, come on Sundays to this private beach. There are other examples, however less spectacular, like the Fare Nana’o (1990-2004), built by Monique Michel in Faaone on the Isthmus of Taravao out of recycled wood from the construction of Taravao’s port on the East coast2. 5Still other once prized accommodations are close to become a wasteland. In Papearii, the Botanical Garden and the Gauguin Museum3 are a mere shadow of their former selves. The garden is partly abandoned: the wooden pontoon enabling the access to the mape forest is dangerous, invaded by termites, and the orchid greenhouse is destroyed. Only the lawns continue to be taken care of. The stray dog bite scandal in 2009 concerning one of the two Galapagos giant tortoises that the Botanical Garden has in its possession, indicates that security service is no longer provided. This incident follows other scandals in relation to Gaston Flosse, the former president of French Polynesia, who illegally built a helicopter landing pad on the same site that was never used. He has also built luxurious fare, that have been squatted on by dignitaries of successive Polynesian governments. 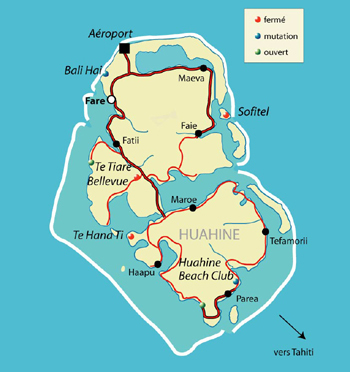 6Huahine is the island where the phenomenon of the tourism wasteland is most visible. Out of six hotels in activity in the late 1990s, only the Te Tiare Beach Resort (opened in 1999 and renovated in 2003) is still operating. The five others have all closed down, even though at the airport tourists can still see their ads on a big rosewood (miro) sculpted map of the island. Bellevue Hotel (linked to PEC – Pacific Experimentation Center) and especially the Bali Hai (1973-1998/2001) (Document No.3a) in the port of Fare (where tourist activity never really recovered after the 1983 violent cyclones) are among the oldest wastelands. 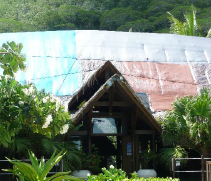 The Hana Iti and the Huahine Beach Club, in Parea, closed in 1998 after the passage of a violent tropical depression. The Sofitel Heiva in Maeva closed in 2003/2005. The story of the Hana Iti Hotel deserves to be mentioned. This original and luxurious hotel, built by the co-founder of Microsoft, Paul Allen, was the symbol of successful integration into the natural habitat (Document No.3b). The wasteland resulted in a revealing exhibition of illegitimate appropriations. Implements were looted (especially sanitary appliances) and the installations were reduced to pieces (roofs and roof structures, window and door frames). In the end, all that remained were concrete sheets, rotting in the humid undergrowth. The property was bought by the Territory and for a while was occupied by the PIG. At present, only the mutoi lives there. He is paid by the Territory, governed by a historical opponent to Gaston Flosse4. To increase its income, the PIG plays the role of a Robinson. Thus, it offers tourist services: visits of the Hana Iti wreckage, the maa’a tahiti with Tahitian oven and fruit picking. The PIG also makes and sells flower and shell necklaces, drives off mosquitoes and nonos from the beach… all in order to welcome passengers coming from Bora Bora to discover this heavenly environment. Moreover, the PIG owns the adjoining land where the access track to the Hana Iti wreckage is located… and hence bans automobile circulation. As a result the area has become a quite well-preserved isolate. 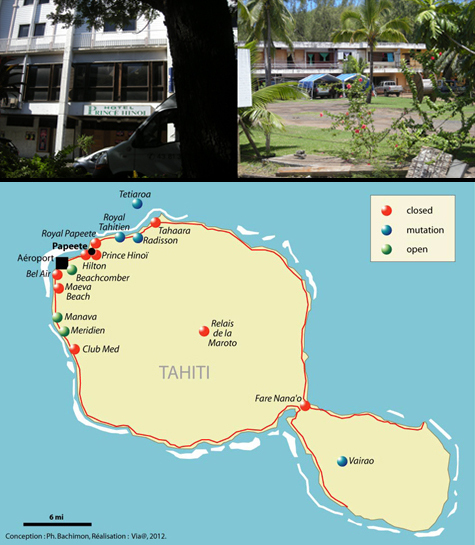 7The Club Med Resort (1963-2005), the Moorea Village (also called Fare Gendron), and the Cook’s Bay Hotel (Document No.5a), all French Polynesian historical hotels and resorts, have been closed… without being demolished. However, a fire broke out and looting is common on these wastelands (Document No.4 b&c). Indisputably this reality has a high impact on the landscape of Moorea, the most touristic island of French Polynesia. These impressive-in-size tourism wastelands are located on the “seaward side” ring-road. Their considerable land hold on the tourist zone became the main obstacle in maintaining tourism activity. Here, too, re-appropriation operates. Owners squat on bungalows left on their piece of land and cruise passengers come alongside the pontoon of Cook’s Bay Hotel where a Tahitian dance show and a tourist market are held… Our 2009 and 2010 inventory shows that the hotel wasteland leads to new mis-uses. Thus, about 20 % of the additional businesses outside of accommodation (catering, pearl and souvenir sales) were closed, while "almost wastelands", like the Tiki village in Haapiti (Document No.5b) were damaged, partly squatted on by their service providers and visited as such, in a kind of hyperrealistic presentation, offering a behind the scenes vision of the folk decor usually shown to visitors. 8The island of Bora Bora is the third most popular tourist destination in French Polynesia, after Tahiti and Moorea. It is the one that receives the crème de la crème of international tourists (often as a honeymoon destination) in luxury hotels, thus multiplying the pontoons of fare constructed on the lagoon. On the highest part of the island, one by one, hotels closed, while some never even opened (the Hyatt Hotel for example). Thus, legendary hotels such as Bora Bora (closed in 2010 after 40 years of activity) or the Club Med (closed in 2007) ceased to exist. But even on islets (motu), where upscale resorts were built (Sofitel, St-Regis, Four Seasons), some are already closed. This is the case for the Lagoon resort, closed since 2010. Bora Bora is the island which most benefited from tax exemption. The measure enhanced accommodation quality but didn’t take into account the existing offerings. In the end, the big island is a succession of wastelands, especially towards the emblematic Matira Point where only two hotels and some bungalows are still in activity…and the bungalows there are rented to locals. Only six guest houses remain open, and their main customers are employees rather than the friends and family tourist market segment. 9Few French Polynesian islands don’t have tourism wastelands (Document No.1), except of course, the smallest and the most remote ones, which don’t have any tourist activities at all. Thus, even the Austral archipelago is affected. The Tubuai island doesn’t have any hotel which is still open (one exists, built by the Aumeran family, but in reality this hotel never really opened). It appears that on the Rurutu island the situation is less dramatic. However, the Rurutu Village is in a state of semi-abandonment in terms of tourism activity (only two to three pension hotels are opened). On its highest point, Tahaa (Society Islands) has some visible tourism wastelands while on the peripheral motu, as for Bora Bora, some pensions and hotels, sometimes luxury hotels (Paradise Resort, Vanira), have opened. Elsewhere, it’s the entire tourist infrastructure that disappeared. In 2011, on the Rangiroa atoll in the Tuamotus practically no hotel was still open. On the Tetiaroa atoll, where French Polynesia is asking for wildlife sanctuary classification by Unesco, a hotel which was opened in 1973 by the American movie star Marlon Brando, closed in 1998. However, in 2009 a new hotel called Brando’s was under construction. Now, in 2012, the building site is still in progress. Lastly, the Marquesas Islands must be mentioned. Barely opened to tourism, here also the tourism system is rather unstable, as in the example of Farme de Toovii in Nuku Hiva. The Farm is a group of five bungalows located on a high plateau (ruined by mismanagement and devastated by looters) which partly re-opened in 2011 to welcome some participants to the Marquesas Games…before the murder of a yachtsman tarnished the event. 10The preceding inventory reveals a great vulnerability of French Polynesia to tourist wastelands. When this phenomenon appears -sometimes insidiously- and lasts, it reflects and amplifies the high instability of a tourist system extremely scattered with small size components. Hence there is importance in accurately measuring the tourist wasteland’s magnitude and identifying its various forms. As often, the tourist wasteland is paradoxically the most stable state of being of the tourism sector. 11To assess the phenomenon of accommodation abandoning, it is necessary to first consider it as an “inactive stock”, which grows with every new hotel closure while openings (those of hotels or other leisure activities) who represent the "active stock”, do not draw nearly as much as would from a resource that is both land and property (Document No.1). Furthermore, French Polynesia’s distinctive characteristic is its low capacity for restructuring tourist wastelands, especially if it is to do so by maintaining a tourist or leisure activity. This could seem paradoxical with regard to the often excellent location of the wasteland. 12The following graphic model (Document No.7) gives us a representation of processes in action. The “inactive stock” is strongly fuelled by hotel closures, whereas it is insignificantly influenced by the few re-openings. As a result there are increases around what we must call its core (Document No.1), that is to say the oldest wastelands (Bel Air, Holyday Inn, Hyatt) tend to become static in their decay as they age. Knowing however that the closure date is vague – partial activity, re-openings followed by closures, all this is quite confusing even for the best archivists. Thus, the identification plate of a hotel that has been completely closed can endure for decades5. If the core of the ‘inactive stock” seems well consolidated, its peripheries are blurred. If we go back to the Novotel Hotel example in Bora Bora, at the beginning of 2011 it is thought to be opened. However, the few clients that have spent their holidays there reported its decay on the internet: the hotel’s signage disappeared (Document No.6b), and was actually occupied by the staff and its fetii… becoming a shadow of its former self. This group, spatially discontinuous, presenting only some important concentration in Haapiti on the Moorea Island and in the city of Papeete on the Tahiti Island, is widely unknown. Denied for commercial “reasons”6 in its transitional stage, the stock is de facto disparate (resorts, villages, pension hotels, small hotel businesses, restaurants, curios), making it hardly identifiable as such… yet it is lack of awareness of the whole phenomenon that we will examine. 13We shall describe the dynamics of the wasteland that will always start with insidious micro evolutions that will lead to the sterilization of sites for years – the most ancient wastelands actually disappear in “secondary” forests. 14The first visible aspects of abandonment come after a significant drop in maintenance (the weekly mowing of the lawns is no longer being done, the surface of the buildings is chipping, the fare’s niau roofs are leaking, piles of plants rot under old tires and mosquitoes are nesting in pools of standing water… (Document No.5b)). In just a few months later, the first "irreparable" deteriorations of the building, where leaking roofs that are at best "sheeted", appear (Document n° 6b), and there is invasion of wild and luxuriant plants (such as the shrubby and thorny Sensitives and Lantanas plants, that can grow up to one meter high or the woody plants like Guavas, Falcatas, and Miconias)7. The impenetrable mess evolves into a dense forest and the air gets even more humid. Especially in the low enclosure of plots, the ambient humidity accelerates as the rusting of wire fencing and the rotting of wooden posts. The beach is re-colonized by the Purau and gets infected with Nonos8. And when the beach is artificial, it is eroded by heavy swells and storms. 15As a result, irregular activities can appear in this re-naturalized deserted area, ranging from short-cuts that go to the beach, to the re-appropriations by squatters for numerous activities (culture of Paka, rave parties, depredation of ruins). The large lobby of the Club in Moorea was used as a skateboard track while the one from Hana Iti housed the PIG9. This stage of depredation being characterized by incivility (graffiti, illicit trade, fires (Document No.4c)) and trespassing, some owners employ a security guard or sell what can be sold (bungalows to be disassembled, bathrooms, ornamental plants). From 2005 to 2007 it was possible to buy the Club’s bungalows wooden frameworks. 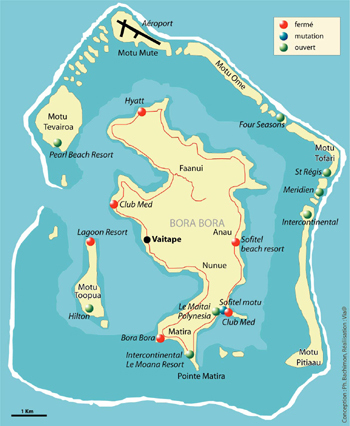 This is still possible for those of the Fare Gendron or the Bora Bora Hotel (Document n° 8). At the end of this stage only the concrete stabs of bungalows’ septic holes are still visible, reflecting the existence at one point of tourism infrastructure…scattered in a dark and inextricable undergrowth. Document No.8: Example of a did up bungalow that became a second home outside its original settlement. 16The spillover effect of the tourist wasteland on the social, economical and cultural environment will complete the process of neglect. Around the Club Med, still in activity, the first and liveliest commercial center on the Moorea Island was built. There were ten restaurants, medical offices, service providers (car rental, gas) and tourist shops (pearl sales, curios). Five years after the resort’s closure, more than half of the shops are closed. Remember also, that the Club was the biggest employer on the Moorea Island, with about 170 employees, without counting indirect assets (fisher purveyors, farmers). All lost either their job or an important part of their incomes and some of them had to leave the island and abandon their houses. 17To this "fatal" spiral we should add elements of resumption which are perturbating and complexifying the phenomenon. French Polynesia hotels are characterized by their enclosure, materialized by a fence which bans access to the site from the mountain side while the sea side remains largely open to the beach so that it can be easily reached by hotel customers. After closing their site, in order to preserve their installations, hotels extended their enclosure also on the sea side (Document No.9b). This happened when several ephemeral re-opening projects were launched on the site. The “recycling” process occurs in this fluctuant setting as these barriers are seldomly impenetrable. It may result in dismantled, stored and resold equipment (for example, sanitary appliances and fare from the Bora Bora hotel) until there is nothing left. It may also result, for some owners, in clearing of brushwood to keep the place tidy. On week-ends, other owners would squat in patched-up bungalows with no running water or electricity connections. They would then set up rainwater tanks and generators (Document n° 8b). This leads to a landscape of glades (manicured lawns around bungalows in a rather good state (Document No.8a)) encircled with undergrowth and forests. 18These mechanisms of re-appropriation, which in situ are considered to be "legal” as they are the result of the actions of “owners” and their families, are not made without characteristic abuses. Thus, if the residence becomes permanent, while in a touristic area, the main encroachment noticed is towards the sea. We observed that on the Club Med’s wasteland, the "pushing the fence towards the beach” attitude had become widespread. An owner who had been able to gain a dozen meters over the supposedly public beach was telling us he did that because he considered that his propriety “extends up to the coconut trees” (Document No.9a). However the annexed backshore was an embankment, sheltered by a Patu (Document No.10). Through this example we identify an important function of the wasteland. Away from prying eyes, illegal activities lead to “faits accomplis”, “facts” that one hopes to make indisputable as the memory of a former reality fades away. Document No.9: Banned access to the beach reinforced by wasteland. 19The abandonment that leads to re-naturalization and then to uncertain re-appropriations, sometimes resulting in new wastelands, is spreading. It is a phenomenon that can be analyzed both as an indicator of a tourism activity in serious crisis, unable to survive in the most beautiful natural sites, and as a catalyst of this crisis. This is why the wasteland can be analyzed through a territorial diagnosis (Dérioz, 2008). 20If we compare the "inactive" stock (the tourist wasteland) and the "active" stock of establishments still in activity, we find that the former with 1.500 closed units (beds taken out of the market), compared to 3.000 opened units for the latter, has considerable weight. Indeed the “inactive” stock is well supported by closures which mark regularly the “active” stock. The average opening length is lowering to 15 years, knowing that investments in tourism are made for 20 years. On the contrary, average closure length is rising to 9 years. French Polynesian tourist wastelands can no longer be likened to an adjustment variable, that is to say a short period of time passing between two successive activities in the same place. In medium and long term the wasteland’s expansion shows it is not considered to be either a land reserve or a real estate opportunity. Actually, it is just the opposite. The tourist wasteland seems to stop any plan of new tourism investments. This latter specificity has to be explained, as in French Polynesia, tourism wastelands have become a lasting phenomenon. This is based on owners squatting on their properties, by illegal occupation in the name of the customary law and sometimes by the guard’s occupation, paid by the legal owners of the property. Nevertheless we have to remember that in French Polynesia, tourism investors do exist — numerous projects are put forward – and the funds to finance them are boosted by tax exemption. This is why the identified blocking mechanism has to be scrutinized. 21Let’s go back to the Club Med example, on the Moorea Island. The resort sets up in 1963 in the Haapiti village (Northern Moorea) on 37 hectares of land bordered by a beach, of 300 metres in length, facing a motu. There are about thirty bungalows built with local materials (pandanus roofs and coconut tree trunk foundations). In the 1970s the bungalows’ numbers double. Unlike other companies, especially in Huahine, the Club Med Resort will not use the climatic disaster argument to close the site. Therefore, in 1983, after the passage of cyclone Veena, the Club rebuilds its bungalows to anticyclonic standards and in 1987, after the passage of a strong swell that damages a part of the lobby, a patu (stone wave breaker) is placed as protection (Document No.10). From 1866 to 1918, Ferdinand Pater was the property’s legal owner. After his death, the property was owned jointly. In 1978, this enabled Club Med to sign a 33 years emphyteutic lease (falling due in 2011) that could be renewed once. For the 29 owners of the property (in the 2000s) the extension of the lease is more problematic than the issue of getting out of the joint possession agreement. 22Club Med’s closure in Moorea is generally explained as the result of family conflict which would have occurred between the owners during the renewal of the lease (Annex 2). In 2002 the Club offers Pater10’s heirs to renew the lease ten years before its expiry as the resort intends to make major renovations (about 5 billion CFP Francs (equivalent of 40 million Euros)). During negotiations Club Med offered to increase the rent from 72 to 660 CFP Francs (from 1 to 5 Euros). In addition, it also offered fringe benefits like giving hiring priority to the owners’ family members for positions like those of waiters, bartenders or service agents. Thus the owner of a 5000 square meter property (this is the mean size of land ownership in Moorea) would have an annual rent gain of about 3 million CFP Francs, an increase from 360,000 to more than 3 million CFP Francs (from 2,800 to 24,000 Euros). Some families refused this offer saying that they wanted their land back for their personal leisure use – the only way the land can be used in a touristic zone. This decision concerned families living in Tahiti and looking for a week-end destination. This attitude led to a gap between, on the one hand, the low income owners for whom the land income is a major part of their gains, and on the other hand, the high income owners, public servants living in Papeete, for whom the lease increase is at most an income supplement that cannot completely justify a long term immobilization of their property. The argument of the Territory’s priority to maintain/develop tourism activities is for the latter a narrow, unsubstantiated claim11. 23Club Med stopped negotiating in 2003 arguing that a higher rent will have negative impact on the business profitability. 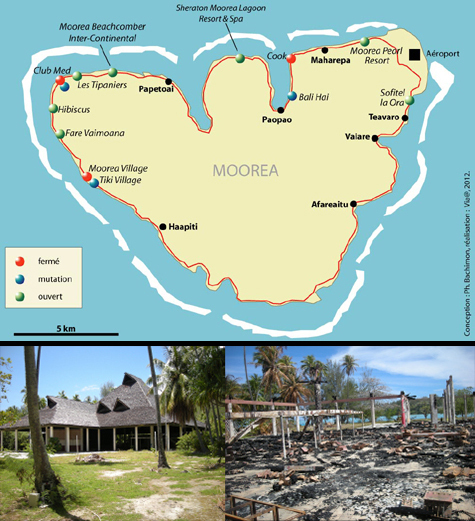 After forty years of activity, the Moorea resort closes in 2005. Thus begins the largest tourism wasteland in French Polynesia. However, it is not a “complete” wasteland as on other sites described above, being still partly used by the owners themselves (20 fare out of 70). For lack of cadastral plan, the owners made a de facto division. This very common practice of « legal or claimed owners squatting on the property »12 takes precedence over the site’s "tourist vocation". Consequently the squat comes down to a substitution of the international tourism-oriented purpose of the site by a more and more permanent residential occupation, even though there is neither running water nor electricity on the site. Despite this precariousness, oppositions to any resumption are increasing as time passes by. (Documents No.11 and 13). 24In the public sphere, tourism wasteland is a taboo subject. The bigger the tourism wasteland gets, the more invisible it becomes (the neighbourhood ignores it and tourists take it for a natural setting). Memory of the site fades away and shut-down hotels can become difficult to spot. That is the case for the Hyatt Hotel on Bora Bora Island (never really completed). The neighbours themselves forgot about the hotel’s existence. Yet they live in fares identical to those of the Hyatt’s (are they using them for themselves and thus deny their existence ?). Occasional informants (sometimes the security guards) make up apocryphal contradictory stories, rendering the wasteland invisible. This is in contrast with the image the wasteland had at its beginnings, when many re-opening projects were often in the headlines (even though there was a doubt about them being successful). This buzz punctuated Club Med’s long agonizing story. It actually started with putting the Club Med project forward, in case the lease was renewed. The project consisted of building a five-star village with 220 rooms and 30 bungalows on the water. The opening was intended for the end of 2003 and the investment would have been of about 50 million Euros, before any tax exemption (Document No.12). Document n°12: Example of an “abandoned project”. Renovated Club Med, a project presented by the Club itself while closing. 25The project of the new Club Med failed. Other projects were suggested, about 4 or 5, the Daleo being the one who received the most media attention. The Daleo was a Fulton Group’s project (2007-2009) aiming to build a new resort instead of the existing one, more luxurious but with less bungalows (about 60 rooms in the same building) and without any fare, except a restaurant13. Daleo offered either an annual lease of 1,200 FCP Francs (10 Euros) per square meter or to buy the property for 25,000 FCP Francs (200 Euros) per square meter, the equivalent of about 3.8 billion FCP Francs (30 million Euros) investment. It also offered to pay Club Med’s remaining lease, that is to say about 45 million FCP Francs (360,000 Euros). An overwhelming majority of owners agreed on the lease conditions. However, five owners refused the offer saying that they want their land back, about 1 ha out of a total of 15. Since the abandon of the Daleo project, the number of new project suggestions decreased in the midst of an unfavourable economic context (high drop in visitor numbers) (Document No.14a). 26While refusing new tourist projects, the owners show they have no vision of general public interest. The political environment is unstable, no issue is addressed by the same minister from the beginning to the end, and no corrective decision is made. In this context, a new element has to be added to the analysis: development of tourism doesn’t have a positive image among locals. Some land owners are no longer country people making their living out of the land income, but city dwellers looking for leisure activities. A property with a good location, by the beach, can hold a high consumerist value, and thus be much more important for their own use, than from a land income perspective. Tax exemption also changed attitudes. Investment is made at the level of 1/3 of a project’s real value. Therefore the project’s “partners” (land owners, banks, hotel chains) become greedier. A priori, the investor looses important capital gains and has to cut down on profit margin by reallocating the benefit from its low risk-taking, and that, from the earliest stages of contract negotiations (Reboud & alii, 2007). This is the adverse effect of the measure and it destabilizes the tourism sector as a whole. Consequently, the tenure status of land set into tourism is less important than the gap between the investor’s short term tax advantage (recovery of the investment 5 years after the project’s implementation) and the long term lease (the owner will get back his/her property in about fifty years). Is tourism in French Polynesia an end in itself ? No debates were held at a local level on whether French Polynesia wants tourism development or not. Except perhaps on the Maupiti island, who, in 2005, held a referendum on the opening of a hotel. The inhabitants voted against the local government’s decision to accept this project. The main reason was that the new establishment, of grand scale, would be competing with the existing local pension hotels. The lack of taking into account the local opinion is reminiscent of the archipelago’s past as a French colony. No referendum was made either for the decision to build the PEC nor for the current status of the community in French Polynesia between autonomy and independence. However, the most astonishing thing to note is, through quantitative and qualitative data, how insignificant is the locals’ contribution to the development of the tourism sector in French Polynesia. 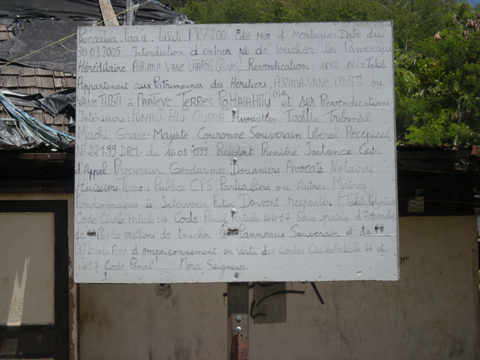 Document No.13: Land claims from « squating owners » of the Bel Air historical wasteland, in Tahiti. a) The rise of the French Polynesia tourism – b) The John Butler Curb applied in tourism. The French Polynesia economy is characterized by successive monoactivities. 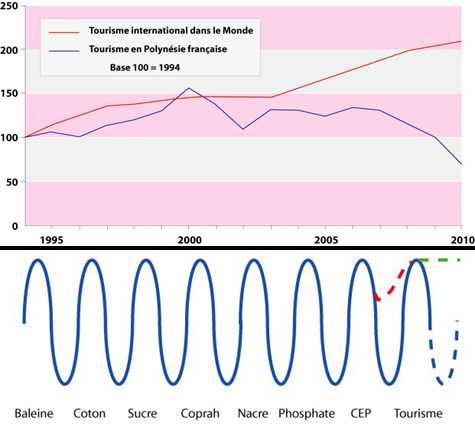 The cycle of the CEP (Centre d’Essai du Pacifique) was supposed to be extended by the belief in a “continuous” economic prosperity given by tourism activities (green dash). 27Tourism is presented as a way of obtaining economic freedom, a wealth coming from the outside, a benefit that has to be appropriated according to the cargo cult practices, in Micronesian societies (Worsley, 1957) (Document No.14b). In practice, things are quite different because as international tourism arrivals increase at the world’s scale, in French Polynesia, they decrease starting in 2000 (Document No.14a). One of the most interlocking aspects of this reality is the patronage and nepotism behaviors that characterize tourism activity in the archipelago. Thus and regardless of the political context, the tax exemption decision – the main tool for public assistance – , has had the exact opposite effect, that is to say, a slowing down of tourism activity (Document No.14a). Under the presidency of Gaston Flosse, the measure favoured large-scale international chain hotel projects (Wane, Hilton, Accor, Sheraton) to the detriment of restoring existing establishments and of smaller local initiatives (Reboud & alii 2007). In compensation, under the separatist presidency, the financial aid was mainly for local pension hotels (paying for a label, buying fare, solar panels and windmills at cost prices or sometimes even getting them for free). Sometimes the owners opened their establishments to the tourism sector for only short periods of time or even worse, they never opened them at all. During the « good times » of tourist activity in the archipelago, the two types of accommodation coexisted peacefully, the pension hotels targeting the locals and the luxury chain hotels, the international tourist. However, when tourist arrivals lowered, both looked for solutions to avoid bankruptcy. The chain hotels lowered their prices (especially on Moorea Island, very close to Papeete), targeting high income local tourists. The pension hotels had the same strategy of lowering their prices, and were communicating their offers in “National Tourism Fairs”, with the support of Air Tahiti, the public airline company that monopolizes transportation to and from the Society Islands (Du Prell, 2003). This resulted in a considerable tension between the two types of accommodation and a weakened profitability of the whole. Pension hotels should be more resistant than chain hotels in this kind of strategy (less employees, less fixed costs) provided that the family-owned business is professionalized. In reality, this is not always the case and discouragement (the famous fiu) pushes owners to slow down the activity (a minimum maintenance of the accommodation, restricted opening times, carelessness). This ends in a partial abandon of small structures, temporary or permanent. It becomes understandable how the tourist wasteland phenomenon is spreading, from the resort to the pension hotel, and affecting the whole sub-contractual end of tourist services14. 28A conflict will definitely rise from the contradiction between the official public discourse – unanimously in favour of tourism development – and private discourse – accompanied by a practice closer to fetii’s and some voters’ expectations. If not, perhaps this denial of an increasing tourism wasteland will drag on, especially when the “rational” speech is held in French and the “cultural” one, in reo maohi (Saura, 2010). In the end, bilingualism could lead to the perpetuation of the conflict between the local and the global, with tourism wasteland being its recurrent spatial expression. It is worth noting that the few re-openings that occurred were due to second homes projects. 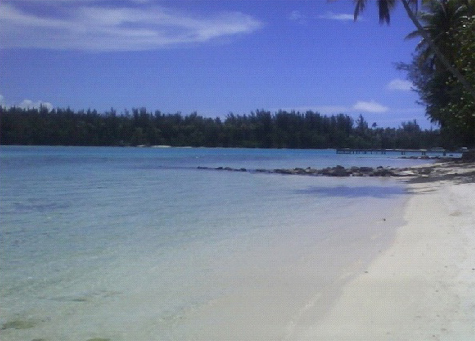 We mentioned the Huahine Beach Club, closed in 1998 and replaced by newly built houses in Parea. While the Bali Hai in Moorea, the Manava and the Radisson in Tahiti were converted in apartment hotels. Most of the failed projects are in second homes for the over-fifties. As if second home projects are receiving a broader consensus than tourism projects. Locally, tourism wasteland are not well grasped. While the tourism wasteland is visible, no retrospective or introspective analysis is made. Moreover, the tourism wasteland is not called by its name as Polynesians talk about ‘abandoned places’. It is only when a re-opening project is considered that the abandoned place becomes a tourism wasteland. The wasteland is visible when the time comes to consider a new project on it, often not carried out or not feasible, like an umpteenth remake of the cargo cult (Worsley, 1957). All indicators (impact on landscapes and leisure activities, echo on the peripherical tourism activity) show how widespread and unpredictable its consequences are. This is explained by joint ownership of the land, “the French Polynesia scourge”. Numerous resorts (Club Med, Bel Air, Méridien…) appear to be its victims (Document No.14b). However, this detail is simply a way of confirming bad managing strategies, as hotels not facing land joint ownership problems are also closed (Cook, Tahaara, Hana Iti…). Tourist wasteland extension is mainly fuelled by “squatting” land owners. It results in unsightly, precarious housing conditions and, most importantly, it is synonymous to obstruction (numerous lawsuits but few evictions). There is a refusal from local populations of economical development based on inbound tourism. This attitude can be an unspoken consensus between, on the one side, those who copy the tourism model for their own use, and on the other side, those for whom land has a symbolic value. Conversely, territorial policies, where the economic or political independence objective is based on tourism development, could be an illusion. Analyzing territorial policies and their outcomes, we can see that they are rather more restrictive than expansionist. Therefore, by favouring “enclosed” tourism (golf, resorts, cruising holidays) (Cazes,1984) to family and friends tourism (much more opened to the outside world of tourism), the territorial policies accentuate the marginalization of tourists, causing their rejection. This is all the more “true” since no serious quantitative study was undertaken on tourism development (Gay, 2009). Indeed, a territory that has successful tourism development should welcome about 5 to 10 tourists per year per inhabitant. This means that French Polynesia should welcome each year about 2 million tourists. In reality, the archipelago counts only 150,000 to 200,000 visitors per year. However, who in French Polynesia would want to see 2 million tourists arriving each year ? Tourism companies, of course, but they are almost never called in when it comes to political decisions. The decision-makers grant favors mainly to small size property owners who are in the second home economy (building, renting… squatting in second homes). Ultimately, tourism wastelands could become the subject of cultural tourism, like the marae, ancient polytheist temples or like the 19th century old colonial coconut plantations abandoned in the 1920s where the main tourist infrastructure has now been built (Bachimon, 1998). Preserving measures could be taken and the tourism wasteland could become a Polynesian heritage site, a testimony of the main economic activity in the second half of the 20th century. Thus, tourism wastelands would be part of the tourism ‘identity’ and heritage (Mc Kay, 2008). They could then be introduced, as a preventive measure in identified and well-protected tourist zones, to avoid the urban squall that results from squatting on the land resources dedicated to tourism activities and making any re-opening project or its conservation impossible. Bachimon Ph., 1998, (ouvr. coll. ), “From Eden to Tourist Paradise Tahiti and the geography of paradisiac spaces”, in Jost C., The French-speaking Pacific. Population, Environment and Development Issues, Australie, Boombana, pp. 205-220. Bachimon Ph., 2004a, « Un paradis touristique sous le soleil de Satan », in Regnault J.-M., François Mitterrand et les territoires français du Pacifique 1981-1988 Mutations, drames et recompositions. Enjeux internationaux et franco-français, Paris, Librairie de l’Asie Culturelle, pp. 177-186. Bachimon Ph., 2004b, L’image de Tahiti véhiculée par les artistes anglophones et francophones à l’époque coloniale, The Journal of Pacific Studies, vol. 27, n° 1, pp. 23-37. Bambridge T & Neuffer Ph., 2002, « Pluralisme culturel et juridique: le foncier en Polynésie française ». in Bambridge T., Doumenge J. P., Bruno O., Simonin J., Wolton D. (Eds), La France et les Outre-Mers. L’enjeu multiculturel, CNRS Éditions, Hermès n° 32-33, pp. 307-315. Bambridge T., Ottino P., Rigo B.& Tetahiotupa E., 2007, « Appropriation du littoral à Tahiti et à Nuku-Hiva (Marquises) », in Risques et Nature. Sociétés et Développement, Publication des Assises de la Recherche française dans le Pacifique. Cazes G., 1984, « Tourisme enclavé, tourisme integré: le grand débat de l’aménagement touristique dans les pays en développement », Cahiers du Tourisme, Aix-en-Provence, CHET. Chaline C., 1999, La régénération urbaine, Paris, PUF. Clément G., 2004, Manifeste du Tiers paysage, Paris, Sujet/objet. pérationnelle et interdisciplinaire des problématiques environnementales » in Interdisciplinarité et gestion environnementale: Partage d’expériences autour de la psychologie environnementale, France, Nîmes, ARPEnv. Du Prell A. W., 2003, "Paroles et actes", Tahiti Pacifique Magazine, n° 143. Gay J.-Ch., 2009, Les cocotiers de la France, Paris, Belin. Mc Kay G., 2008, « The Effects of nuclear testing in French Polynesia », Annual Review of Undergraduate Research, College of Charleston, vol. 7, pp. 109-116. Pearce D. G., 1980, Tourism in the South Pacific: the contribution of research to development and planning, UNESCO Tourism Workshop, Rarotonga, June 10-13, 1980. Poirine B., 1994, Tahiti: la fin du paradis, Paris, l’Harmattan. Reboud V., Montet Ch., Laffargue J.-P., 2007, "Analyse des effets du dispositif de défiscalisation local en Polynésie Française. Un premier essai sur le secteur hôtelier", Mémoire de Paris 1. Saura B., 2010, Tahiti Maohi, Papeete, le Vent des Iles. Soja E. W., 1996, Thirdspace. Journeys to Los Angeles and Other Real and imagined places, Cambridge (MA), Blackwell, 334 p.
Staszak, J.-F., 2006, Gauguin voyageur, du Pérou aux îles Marquises, Paris, Solar-Géo. Vannier M., 2003, « Le périurbain à l’heure du crapaud buffle: tiers espace de la nature, nature du tiers espace », Revue de Géographie Alpine, n° 91-4, pp. 79-89. Worsley P., 1957, The Trumpet Shall Sound: A study of "cargo cults in Melanesia, London, MacGibbon & Kee. 1 Property of Reginald Flosse, son of Gaston Flosse, the Tahaara Hotel went bankrupt in 1998. Any re-opening seems impossible as in 2006, both Reginald and Gaston Flosse have been sentenced for taking illegal advantage. In 2008 was mentioned a project of building instead of the Beach House a luxury residence, in the park next to the hotel, by the beach. Since then, nothing was done. 2 The port itself is a wasteland characterized by an empty graving dock and an activity zone with low occupancy. The exposure of the port to high swells coming from the East is one of the main reasons to that. However, local planners didn’t take it into consideration and important damages were caused to the coastal environment as well as financial losses for the local community. 3 The Botanical Garden was created in 1919 by Harrison Smith. Inaugurated in 1965, the Gauguin Museum is an initiative of the Singer Polignac Foundation. The museum opened 60 years after the painter’s death, in the Marquesas Islands (1905) and is situated in the park of the Botanical Garden (Staszak, 2006). 4 PIG: Polynesian Intervention Group. Gaston Flosses’s Praetorian Guard (1995-2004). In 2011, the French Polynesia separatist Government, is still debating over the integration of the « 123 remaining PIGs » to the public service, knowing that the Group is an illegal entity. 5 We were citing the imposing map at the Huahine airport indicating nonexistent accommodation. In Tahiti too, we can still find indications for the Bel Air Hotel even though it is closed for 30 years now. In fact, these indications are in a round-about, built after the hotel’s closure. In its oral naming, the site (that has become touristic) lasts longer than its function. This may seem surprising on these islands, where the means of signaling and the toponymy are imported. 6 The Tiki Village case on the Moorea Island is symptomatic. Still opened, it is likely to work as an adrift boat, taking on water (Document n° 5). Nevertheless it is presented as one of the best accommodations on the island and actually many tourists are satisfied with its services. This has a logical explanation. The Tiki Village is a unique concept, a mix of history, customs and local products… in a sort of genuine atmosphere that tourists can only find in this place, in an allegorical environment – made out of stucco – around a diner-show. 7 More precisely, this invasive vegetation is made of shrubby and thorny plants like the Sensitive (Mimosa pudica) and the Lantana (Lantana camara) and trees like the Chinese Guava also called Tava tinito (Psidium cattleianum), Miconia or Pa’ahonu (Miconia Calvescens), Falcata (Molucca albizia) and the African tulip tree (Spathodea campanulata). 8 The Purau (Hibiscus Tiliaceus) is a tree that transforms the area where it is growing in a mangrove-like environment. The Nono is a tiny dusk insect (of Culicoides type) know by the sunbathers for its painful stings. 9 Some resorts, like the Hana Iti, in Huahine, were systematically depleted (roof structure, hinnies, sanitary appliances) even though they were guarded. 10 Pater legatees are divided in seven families sharing the land’s ownership. The seven families are the Maioas, the Bonnets, the Tessiers, the Salmons, the Estalls, the Paoas and the Paters. 11 In French Polynesia civil service bonuses (wages are 1.8 times higher than in metropolitan France) created a deadweight loss effect and attracted employed labor force from the private sector (especially from the tourism sector, challenged by the rest of the international tourist destinations and therefore less lucrative). Hence, an artificial high purchasing power was created (land income became less important), resulting in immediate goods and leisure hyperconsumerism with visible impacts on daily life (high rate obesity, car overequipment) leading to a negative impact on the destination’s image. 12 Actually there are three possible situations: occupancy for leisure purpose, in an area where no main residence is permitted ; occupancy in the name of an aboriginal right refuted by the legal owners ; unofficial shared occupancy of a jointly-held property. There is also another situation, more complicated, when the property is occupied by a paied or unpaied keeper, having no legal rights on the property’s ownership (Bambridge & alii, 2002 & 2007). 13 This detail is quite interesting. The argument is ecological (protect the lagoon) even though in reality, no fare would be built because of neighbourhood disputes (the neighours didn’t want any fare in front of their properties). 14 In terms of tourism development, public action is often counterproductive. This is true even for key measures as the decision to control international flights that led to the creation in 1998 of the public run airline company Air Tahiti Nui (ATN). This decision was taken in order to fight low cost companies’ grip over international airline traffic in French Polynesia. Till 2003, the price dumping strategy was successful. New international inbound destinations were opened like Osaka (Japan) and New York (U.S). Price policy changed again and ATN decided to line up with Air France to make good the deficit on these two new destinations. Finally, in 2008, ATN decided not to serve anymore Osaka and New York. Traditional destinations are maintained (Paris and Los Angeles), but the price to be paid is a colossal debt (in 2011 the deficit was of 16 billion CFP Francs (120 million Euros)). This points out that ATN was not thought out as a tourism development tool but as a way of opening up for the Polynesians. Employees’ “enlarged” families have free of charge flights and the company’s debt has been included to the public deficit. Thus, through ATN Polynesians had the opportunity to travel more by making tourists pay more (Metropolitans pay two supplements, for the ticket and for the French Polynesia public deficit). This has a direct impact on the extending tourist wasteland who it is getting even bigger since 2008 (Document No.1). Via Tourism Review est mis à disposition selon les termes de la Licence Creative Commons Attribution - Pas d'Utilisation Commerciale - Pas de Modification 4.0 International.